When you create a product in your online store, you'll be provided with a product type option. For automatic membership tracking, select either Family, Parent or Student Membership. Make sure that you also note the name required when the parent adds the item to their cart. The system will automatically display available names from the family record. Once the purchase is successfully processed in PayPal OR by recording a manual sale the family, parent or student's membership status will automatically be updated. As you may recall in the article about membership types, the system supports tracking family, parent or student membership. 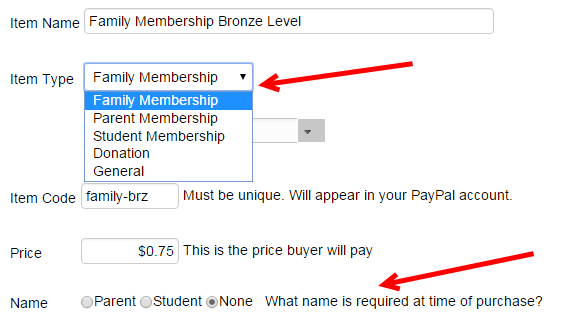 Note that parent and student membership are considered "individual" membership as they apply to the specific person. Family membership is for noting membership for the entire family, including all parents and students in the family. IF you are not recording sales in your MSA account and just need to check the box to identify members, do the following. Go to Membership and select either Family, Parent, Student or Faculty. Select Add and you'll get a window to update the membership details.